The Peninsula offers a wide variety of home styles and locations, in nine different neighborhoods each with its own distinct character. Regardless of the type of home or neighborhood, all lawn and landscape maintenance is performed by the Peninsula Community Association (the PCA). Condominiums. Located in the Windswept and Marina Bay neighborhoods – These are apartment-style homes, all on one level in elevator-equipped buildings. Sizes range from 2- to 4-bedroom, and approx. 1,325 to 2,800 sq. ft. Most include a screened porch and reserved parking space under the building. Some include a private 1-car garage. Townhomes. Located in the Conservancy and Marina Bay neighborhoods – These are 2- or 3-story homes that share one or two walls with another home. Each has 3 or 4 bedrooms, with sizes ranging from aprox. 1,900 to 3,000 sq. ft. Floor plans vary, and 1-car or 2-car garages are included. Most have patios, decks, screened porches, and/or other outdoor living features. Villas. In The Peninsula, a “villa” is a detached, single family home that is part of a condominium association. Villas usually range from about 2,000 to 3,500 sq. ft., and 3 to 5 bedrooms. 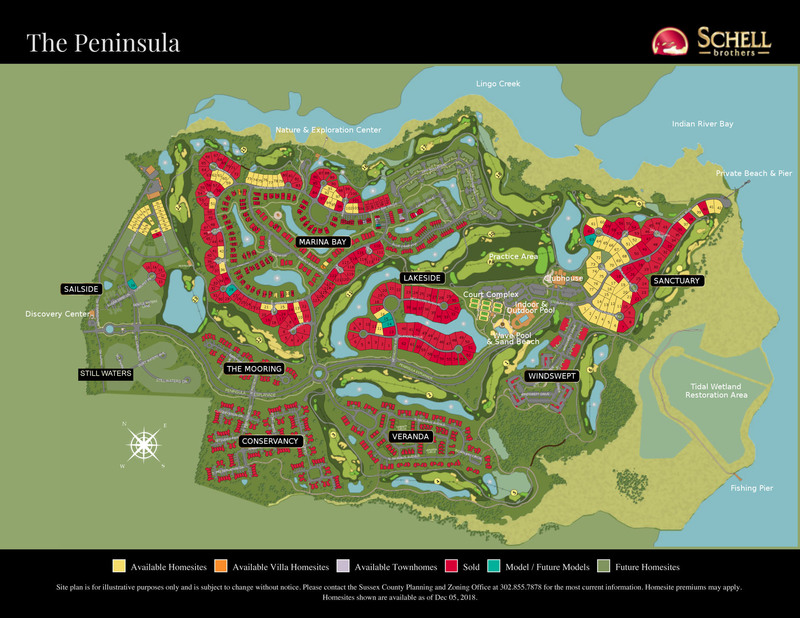 Villas are located in the Sailside, Conservancy, Veranda, and Marina Bay neighborhoods. There are many different designs. Single Family. These homes may be found in the Sailside, Marina Bay, Lakeside, Sanctuary, and eventually Still Waters neighborhoods. Lots sizes vary, from about 1/5 to 1/3 acre. Many have golf course and/or water views. The smallest are around 3,000 sq. ft., and the largest has been built at over 10,000 sq. ft. (on two lots).